Skateboarder Jamie Collins’ legacy lives on at the fourth annual Ramp Camp for Kids. 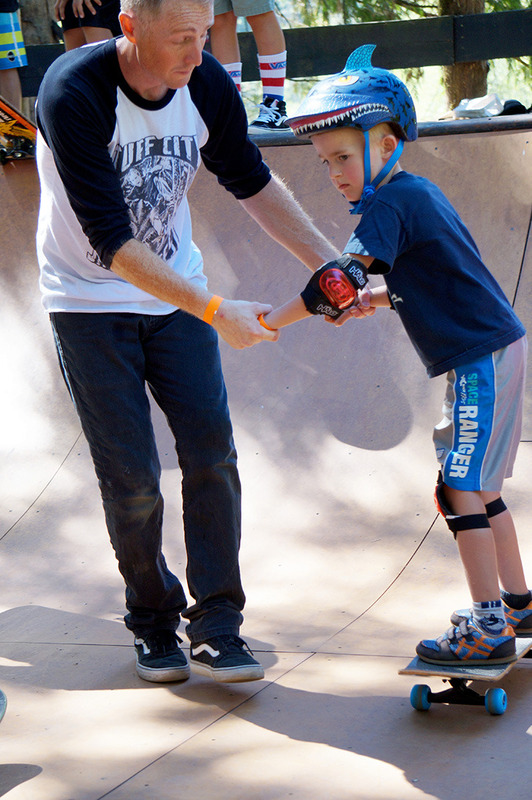 Jamie Collins’ legacy continues as young and enthusiastic skateboarders learned new skills from the Instrumental Skateboards team at Arrowvale Farm and Campground for the fourth annual Ramp Camp for Kids. A mini ramp and a 2000 sq. foot cement skate park were available to the novice skaters to work on their tricks while learning from the older generation on Saturday, Aug. 20 and Sunday, Aug. 21. In addition to having fun on wheels, kids and their families enjoyed a slip and slide, the river and camping at the farm. The kids’ camp began in the wake of Jamie Collins’ death in 2012. Collins, who grew up in Port Alberni had a passion for skateboarding and began the Vancouver Island skateboard company, Instrumental Skateboards, in 2007 with his best friend Brandon Wells. Wells, who continues to organize the camp said this year’s turnout was good and that the whole Instrumental team came out to skate with the kids. “We started out with just the mini ramp but we were getting a bit overfilled so we decided that we’d build a mini skate park,” Wells said. The camp is geared towards introducing skateboarding to kids while being in a family-friendly environment.